The Yellin Center Blog: Newsday Webinar on "Selecting the Right College"
Susan Yellin, Esq., the Director of Advocacy and Transition Services at The Yellin Center for Mind, Brain, and Education (and frequent contributor to this blog) has been invited to serve as a panelist for a free webinar on "Selecting the Right College." 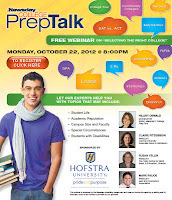 The Newsday College PrepTalk webinar will take place on Monday, October 22, at 8:00 PM (Eastern). Topics that will be discussed include: Student Life, Academic Reputation, Campus Size and Faculty, Special Circumstances, and Students with Disabilities. The free event is sponsored by Hofstra University. For more information about upcoming Yellin Center events, please visit our Events page.